Al Bowers (left) attaches a bungee cord to the Prandtl-d glider — the forerunner of a Mars glider concept known as Prandtl-m — as Kassidy McLaughlin (right) prepares to release and launch the aircraft during a test. 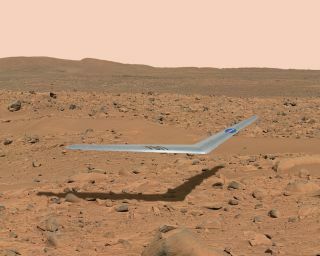 "It would be able to deploy and fly in the Martian atmosphere and glide down and land," Bowers added. "The Prandtl-m could overfly some of the proposed landing sites for a future astronaut mission and send back to Earth very detailed high-resolution photographic map images that could tell scientists about the suitability of those landing sites."